Thoughts and ranting of a software developer. Like millions of other folks, I have a smart TV, or simply a tiny android box that plays Youtube music and Amazon Prime videos. I also like to run pfSense firewall, with pretty much out-of-the-box setup. While checking firewall logs, and reviewing the usual scans for open ports 23/22 on my network, I decided to start blocking certain geo-locations. That's when I noticed my smart TV sending data to two IPs in China, about every other minute. Launching adb server, android shell and few minutes later -- the app responsible for those pings is com.waxrain.airplaydmr2, one of only 3 custom apps installed on the device. This got me curious of what other traffic this smart TV is leaking. Among the usual Nvidia telemetry (even though it was explicitly disabled in the OS setttings), there is chatter to Adobe, Facebook and a bit of others. With pfSense however, we can easily quiet this chatter down. First, we need to decide which traffic we care about. I only care about youtube and amazon at this point, and while those two also query a ton of telemetry we'll just have to take the bad with the good here. But outside of those two services, the smart TV should be completely silent and invisible to the outside world. In order to block other traffic, we will create a pfBlockerNG alias to isolate google, amazon, and akamai (content delivery service for amazon video) using ASNs. Upon alias update, pfBlockerNG will resolve those ASNs to IP addresses that we can reference in firewall rules. 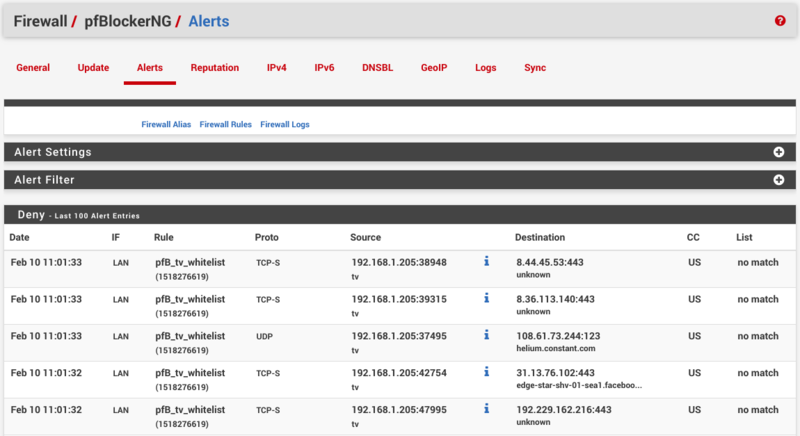 In pfSense, navigate to Firewall / pfBlockerNG / IPv4 and click Add. Now pick a cool alias name (such as tv_whitelist), set List Action: Alias Native, which means pfBlockerNG will only create an alias (in Firewall / Aliases / URLs), and won't add actual firewall rules. Further down in IPv4 Custom List tab, check Enable Domain/AS and paste following ASNs into Custom Address(es). Once alias is saved, run pfBlockerNG update and reload steps on Firewall / pfBlockerNG / Update page. The log should state that a few thousands of IPs have been added, about 19000 as of this writting. With pfBlockerNG alias in place, on WAN firewall page (Firewall / Rules / WAN) add a new rule, with Action: Block, set Destination to the IP of smart TV, and Source to pfBlockerNG alias (in my case pfB_tv_whitelist), and check Invert match option. Since this rule is blocking, Invert match will treat those IPs as a whitelist. Similarly on LAN (Firewall / Rules / LAN), add a rule to Action: Block, Invert match on Destination: pfBlockerNG alias and set Source as Single host or alias with IP of the smart TV. It helps to enable Log in Extra Options tab, when testing. If logging is enabled, you should see blocked traffic on Firewall / pfBlockerNG / Alerts page. Another way to test is to block a different device on your network, like a smart phone, and verify that you can reach youtube, amazon, and nothing else.